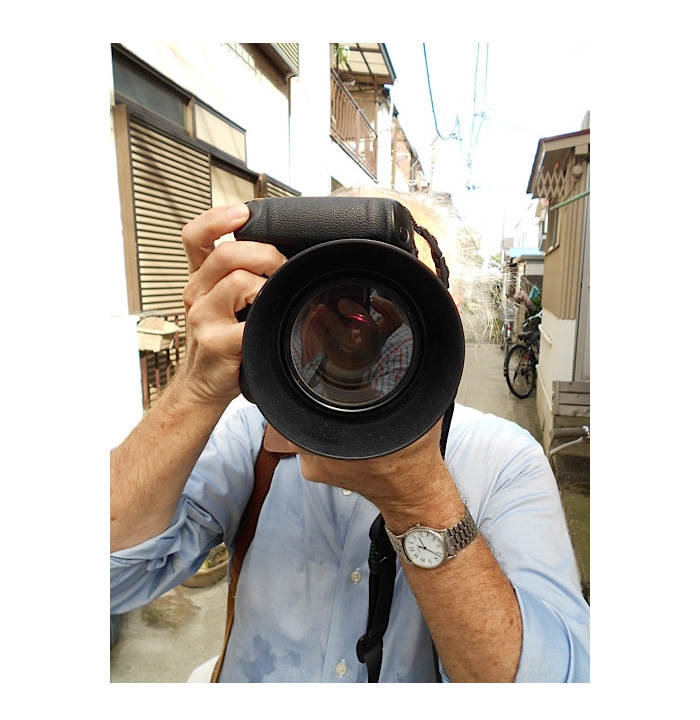 This past September, photographer John Gossage and bookdealer Harper Levine traveled to Japan to scout for books in Tokyo’s Jimbocho book district, to take photographs for a forthcoming Gossage book, and to meet with Japanese photographer Kazuo Kitai. Below are excerpts from a recent conversation with them about their trip and their interest in Japanese photobooks. Q: John, you’ve been collecting photobooks for quite some time now and from all accounts you have one of the best Japanese photobook collections around. Can you tell us about your collection? JOHN GOSSAGE: I don’t call it a collection; rather it is a photographer’s excessively large working library that allows me to have a dialogue with the medium. I go out of my way not to buy perfect copies of any photobooks, because I want to use them. I want to look at the books as photographer to photographer. My interest in photobooks started early on. I was the kid who ran through the exhibition to see if there was a good catalogue. It has always seemed the most compelling way to engage with photographs. If photographs are really good, I don’t want to just stand in front of them and look at them. I want to live with them. Q: You recently traveled to Japan together. Your trip involved a number of different activities. John’s primary mission was to shoot photographs for a forthcoming book, and Harper’s mission was to scout for rare photobooks. Harper, can you talk about some of the books you found in Jimbocho, Tokyo’s book district? HARPER LEVINE: There is no better book city on earth than Tokyo. In Jimbocho alone, there are hundreds of bookstores selling all kinds of books, from high end literature and art, to magazine shops with back issues of Brutus Trip and Music Life neatly ensconced in cellophane wrappers. On our second day in Tokyo, we arrived at our first shop, Genkido, which is one of the best photo bookstores in Tokyo. The prices are reasonable and the staff is friendly. I picked up Masahisa Fukase’s Homo Ludence with the obi and the outer acetate jacket, as well as a copy of the revised edition of Shomei Tomatsu’s Nagasaki. There was also a book of John’s at the shop, which he signed for them. Later, we made our way to Komiyama, a four-floor emporium on the main street in Jimbocho. The top floor has the best stuff, but it’s all properly priced and the buying is tough, especially at 75 yen to the dollar. There were copies of Kitajima’s New York in both obis; a nice inscribed Sentimental Journey by Araki, but with a stain on one page that was a deal killer. I was also pleased to see a nice selection of original photographs by Kazuo Kitai, a Japanese photographer who both John and I are currently working with on a book project. Q: Can you give us some background on the Kazuo Kitai book project? LEVINE: In 2009, I traveled to Japan and met Kitai at his home outside Tokyo. Since then, photographs, ideas, and e-mails have been exchanged with Hiroshi Masaki, a photographer and executive at the Japanese book firm Maruzen, working tirelessly as the interlocutor between Kitai and myself. At some point I realized I had no publishing experience and I would need the assistance of an expert. Few American photographers have been more influenced by Japan than John Gossage. One needs only to visit John’s library in Washington, DC, to understand the extent of his commitment to Japanese photographers and photobooks. It became apparent to me that John’s involvement in this project was crucial to its success. John and Kazuo Kitai share many similarities. They are roughly the same age; they started young; both have published scores of books and have publishing companies of their own; the list goes on. Given John’s intrinsic understanding of Japanese photographic literature, I thought it would be perfect symmetry if he designed Kitai’s book. Plus he’s really good at it. Q: John, how did you approach the design for Kitai’s book? GOSSAGE: Kazuo Kitai supplied Harper with a series of early unpublished photographs from 1965, which were mostly shot around the same time as his well-known protest book, Resistance. In the past, Kitai, who along with Shomei Tomatsu was an influential figure for many of the Provoke Era (late 1960s-70s) photographers, published books which featured a refined sensibility and a very light touch in design. As opposed to trying to replicate a Kitai book, I wanted to capture the early energy of both Kitai as a young photographer and the aggressive book design sensibility of the whole Provoke era, i.e. Moriyama’s Bye, Bye Photography, Yutaka Takanashi’s Toshi-e (Towards the City), and Takuma Nakahira’s For a Language to Come. So I scanned Resistance and degraded the images and used them as a background for Kitai’s uncropped photographs. I also did things that nobody did back then, while clearly referencing a whole group of Provoke photobooks. Q: Throughout the trip, John shot photographs for a book, which Harper will publish in conjunction with a summer 2012 exhibition. How did that project come about? So, I spent everyday during the trip shooting digital color photographs. Many of the photographs are street shots of people in Tokyo, Yokohama and Yokosuka, an American military city south of Tokyo. I hadn’t done street photography in a long time so it was time to do it. With this project, I was trying to push what I do and go way far away from my comfort zone — do things in ways that I don’t at this point understand or know. Allow myself to take risks and accept that a lot of them might fail. Style for me is the sum of my limitations. I can set different contexts, but there will always be a certain overlay of sensibility that I carry with me everywhere. I decided to call the project The Code. After a couple of days of shooting, I came to a general understanding of what The Code would be about. Within the context of my photographic sensibility, I was going between my code and the whole code of Japanese society, structure and language — which I only very occasionally understand. Q: You both spent some time shooting with Kitai during your trip. What was that like? LEVINE: We were able to have a full day of shooting and carousing with Kazuo Kitai, who arranged a car and driver to take us to the area around Haneda Airport. This is not a part of town tourists usually see (or would want to see), but it was perfect Gossage territory: nondescript and unexciting on the surface, but exuding a slow timeless eloquence that John was able to capture in pictures. We started in a mosquito-infested park. At first Kitai did not understand exactly why we were there, but after observing John for a few minutes, he commented how interesting John’s process was, how he could see what John saw, and then he busted out his Leica (with an 80 year-old lens) and began to photograph. He was amused when John started shooting a praying mantis. Seeing two great photographers squatting on the ground with a green bug in between them must surely rank as one of the strangest moments of my bookselling career. When John laid down to get the correct shot, the Japanese men grunted in appreciation. We’ll see if it makes the final cut. *All photographs of Tokyo, John Gossage and Kazuo Kitai are courtesy of Harper Levine. Kazuo Kitai. Resistance (Teikoh). Tokyo: Miraisha, 1965. Kazuo Kitai: Sanrizuka: Plegaria A Un Labrador. Tokyo: Wides Shuppan, Co., 2000. This entry was posted in artists' books, International, Interviews, Seen and heard and tagged harper levine, Japan, Japanese Photobooks, Japanese Photographers, Jimbocho, John Gossage, Kazuo Kitai. Bookmark the permalink.